Every gunsman needs a good holster to go with his handgun, and if you have the Ruger American then you are probably looking for just the right fit. There are tons of holsters for every type of pistol and revolver, and all it takes is a little effort to find the right one. Fortunately we’ve put in some of that effort for you to compile this list of holsters for the Ruger American. Of course, I would like to start off by showing you my top choice. The Comp-Tac International Holster is an excellent choice. It is OWB and kydex material, and is made with a mounting system. Whether you plan to use it for competition, a day at the range, or simply for everyday use, this holster goes great with the Ruger American. Of course, if you are going to the range, you want to be sure you are prepared for going. Let’s look at some tips, recommendations, rules, and gear meant for range-goers. Whether it is your first time to the shooting range or you’ve gone before, you always want to make sure you are prepared; both for safety and for a better experience. If you are new to it, however, it can seem intimidating and confusing. Here are a few tips to remember when going to the range. Have you shot with us before? Do you have eye and ear protection? Do you want any extra targets? Every firearm owner must know the cardinal rules, but if you’re going to the range then they can be especially helpful to keep in mind. There are four basic rules, which I have listed below. Treat every gun as always loaded. Never put your finger on the trigger unless ready to fire. Never aim the firearm at anything you do not intend to shoot. Point it in a safe direction, or always keep it holstered until ready to aim. Be aware of your surroundings and your target’s as well. Know what is beside, behind, and all around for as far as you can see. It is a good idea to have someone with you who knows what they are doing. All beginners are required to take a course before getting started at the range, but having a friend or family member around who knows their stuff will help out a lot in both keeping you comfortable and helping you stay safe. There will be a Range Safety Officer (RSO) available, and they are always there to help. Whether you are new or not, you’ll have questions from time to time so don’t be afraid to speak up and ask away! Eye and ear protection. Have safety glasses or sunglasses with you, and something to protect your hearing. It can get loud there! Wear a baseball hat. This can help because ejected brass tends to bounce, and without the shielding of a hat it has the potential to get stuck between your glasses and your skin. This can burn because it will still be hot. Have a range bag. If you want to be organized and really ready to go, a range bag will be your best friend. DON’T wear low collars. It’s a similar situation as the hat. Low collars, like V-necks, tend to attract the round if the shooter has a looser grip and sends it backwards. It could go down your shirt, and that will not be a fun experience. Your gun and ammo. If you plan to shoot your own firearm, then you obviously want to bring that along. Most ranges will allow you to bring your ammo as well to use with your own gun, but make sure you check to see if there’s any restrictions. Targets. Most ranges offer one free target so unless you bring your own, you will have to be prepared to pay for extras. A screwdriver. It seems odd, but trust me, it can come in handy! While there are the cardinal rules I listed above, there are also some general range rules to follow as well. Keep these ten things in mind too, and you will be a saint at the range. Observe the 180 degree rule, and remember to point your muzzle in a safe direction or at your target when it is not holstered. Like said in the cardinal rules, all firearms are to remain holstered when not in use. Make sure the magazine is unloaded and the hammer down as well, unless otherwise directed, when the gun is outside the holster. Do not leave the firing line until you have shown you are clear unloaded to the designated RSO. Never let your gun point at any part of your body. Always safety check any firearm that it is unloaded when giving or receiving one. Always protect your eyes and ears with proper equipment, such as safety glasses and earplugs. Never shoot or handle a gun while under the influence of alcoholic beverages or drugs. Make sure your weapon is safe before holstering it! Make sure your safety is applied or the hammer is reckoned. Do not leave the range with a holstered gun, but be sure it is packed away safely in a case of some sort. Safety is very important when handling a firearm, and there is no room for horseplay or a lackadaisical attitude. Follow all safety rules, both cardinal and those at your range, and please take care to be mindful of yourself and those around you. Now here are some more holster options for the Ruger American to take a look at. A holster with right and left handed options, this quality piece will assist in the comfort and retention of your firearm. Even as an OWB it is still great for concealment, or open carry, depending on what you prefer and how you wear it. This handmade option is a great choice for that personal touch. It is made in America and is a sturdy and dependable holster. 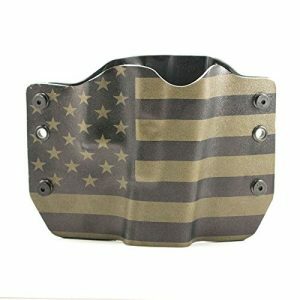 An awesome-looking holster with a patriotic flare, as well as a comfortable and reliable option. With an adjustable thumb break and an ambidextrous clip, this holster is a very decent option for many gun owners. 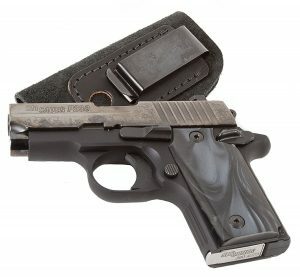 It is made in the US, fully lined, and a dependable holster for security and comfort. 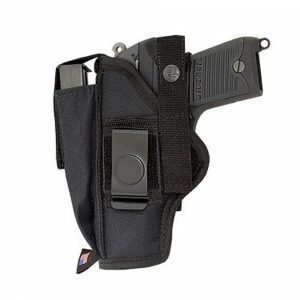 The Comp-Tac International Holster remains our top choice, though the others are great options as well. It is a quality piece and made for comfort and longevity. 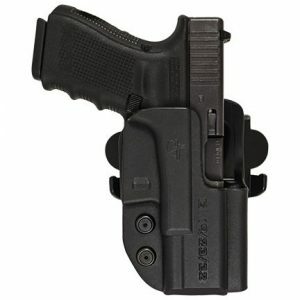 The modular mounting system is great, and all the options available add a fantastic variety of ways to wear this holster. Despite some of the minor cons, there isn’t much to complain about when it comes to this holster. They are all minor, and most can be lived with and do not interfere with the functionality or overall quality of the product. Now that you’ve had a chance to take a look, what is your favorite holster for the Ruger American? Is it on this list or did you find another? Let us know! Have a range story or tips to share? Tell us those too. As always, we appreciate you taking the time to read, and we hope this has helped you narrow down your options and ultimately brought you to a conclusion.